Social media has a ton of marketing power – if you know how to use it properly. Almost 90 percent of marketers say their social marketing efforts have increased exposure for their business, and 75 percent say they’ve increased traffic. In addition, more than 50 percent of marketers who have been implementing social media marketing tactics for two years have reported improved sales. These are statistics that you should think about a lot – especially if you’re not using social media as a marketing tool for your business. Without a strategy of how social media is going to help you market your business, however, you probably won’t find much success on there. Many marketers and business owners often explain their non-existence on social media with one of the following: “it’s not for us” or “it’s too time-consuming” but social media is not as difficult as some might think, and learning how to use it for marketing purposes isn’t a rocket science. When it comes to the argument that social media isn’t something for you, let me tell you that social media is for everyone! Unless you are a business targeting 90+ year-olds, social media is for you. In this article, we’ll teach you the Top 5 Ways to Market Your Business On Social Media! The first thing you want to look at doing is to build brand awareness and increase your authority in the niche you’re in. Brand awareness is essential for a successful social media marketing because it builds authority which ultimately leads to trust. That trust will then be the factor that converts your audience to customers in the long run. Brand awareness also helps establish your brand on social media in a way that will (if done correctly) lead to you becoming a go-to source in your industry on social media, and that’s a position you want to be in as a brand. So how can you actually do this? A common belief is that building brand awareness requires a huge following but that is not the case. On social media, what counts is who your followers are and that you engage with the right audience. Your social media efforts will only generate results if your target audience is the ones reached by them. 1. Influencer marketing. Influencer marketing is one of the most effective ways to reach your audience, simply because the influencer has already built a following that is extremely targeted and in the same niche as you. Therefore, it’s very important that you partner up with the right influencers. For example, if you’re a brand who sells beauty products, teaming up with a male influencer might not be optimal for you. Instead, focus on finding influencers who are women, shares beauty-related content and have a following that is your target audience, because ultimately, those are the only people who will be interested in what your brand has to offer. For example, if you’re a brand who sells beauty products, teaming up with a male influencer might not be optimal for you. Instead, focus on finding influencers who are women, shares beauty-related content and have a following that is your target audience, because ultimately, those are the only people who will be interested in what your brand has to offer. Of course, finding influencers who ticks all of the boxes above can be a challenge, but with Veloce Network Influencer Directory, it’s not. Filter through thousands of industry-leading influencers based on your brand’s preferred criteria and find the ones most suitable for your brand in just seconds. 2. Hashtags. Hashtags are great because they exist on almost all social media platforms. Search for keywords relevant to your niche, for example, if you’re in the tennis industry, simply searching for the hashtag “Tennis” will bring up tons of content that have been posted with that exact hashtags. The people who have posted content with that hashtag most likely have something to do with the hashtag you have searched for, and are probably also your target audience. 3. Spy on your competitors. Because your competitors are in the same niche as you, they have probably built a following of targeted followers, who are just like your competitor, interested in the niche you’re in. Your competitors work like a hub of targeted followers who are all gathered in one place because they have something in common. They are passionate about the niche your competitor is in. Now that you have found your audience and know where they are to be found/spend their time, the real work can begin. Now, you want your targeted audience to become aware of your brand’s existence. Start engaging with them, like a post of theirs, comment, send them a message or tag them in your posts. Only when they become aware of your brand is your brand awareness increasing. Another way of building brand awareness is to share a consistent brand message. By making your brand message consistent, people are able to recognize your brand, no matter which social media platform they find you on. This is a must on social media. At least if you want to generate great marketing results (which I’m guessing you do since you’re reading this). 1. Build trust. As mentioned earlier, trust is the single most important part of making a conversion. If your audience doesn’t trust you, they won’t buy from you either. 2. Show that you care about them. By taking your time to answer every single person who engages with your brand, you show that you value your audience deeply. If they have any questions, answer them as quickly as possible. 3. Encourage them to talk about your brand. People talk about your brand outside of your very own comment section. Find these discussions and engage with the people who are talking. For example, if someone has posted a photo using your product, leave a comment and thank them for their support in your brand. Don’t forget to also ask them to share more posts of your products. Not only do you get free marketing, and a very targeted such because people tend to trust their peers more than brands, you’re also encouraging them to continue talking about your brand – and this can continue outside of social media as well. 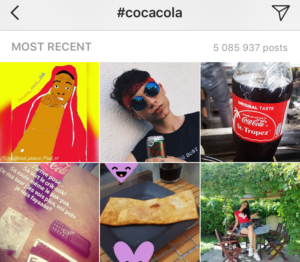 Here, we can see a ton of people sharing photos with Coca-Cola on Instagram. More exactly, over 5 million people. That’s an insane amount of free marketing and exposure for Coca-cola! 4. Increase brand loyalty. When you show your appreciation and engage with those talking about your brand, you are building relationships that are extremely valuable. Happy customers that you’ve built strong relationships with the help of a consistent engaging are the best ambassadors for your brand because they are most likely to recommend your brand to their peers. 5. Solve customer’s issues. Social media is not only a place for rainbows and sunshine. When you are on social media, you have to be prepared to receive some complaints as well. The important thing here, however, is that you don’t see the complaints as something negative. Instead, see the complaints as an opportunity for you to make things right and convert an angry customer into a loyal fan. Of course, this works best if you have a physical product, but it’s not impossible to do it if you’re providing a service. As you know, the best and most powerful marketing isn’t the marketing made by you. It is the peer-to-peer and word to mouth recommendations that are the most powerful. A report by Nielsen which surveyed more than 28,000 Internet respondents in 56 countries found that 92 percent of consumer trust recommendations from friends and family above all other forms of advertising. Therefore, using your very own customers as a marketing tool by getting them to share content of your brand’s products on social media is an extremely effective way of getting new customers. However, even though some people share content of your products by own initiatives, most people need some sort of “motivation” or reason to do so. That is exactly what you want to offer them. 1. Run a contest where the contestants need to post a photo of them wearing/using your product on social media in order to join. Of course, the better prizes you offer the winners, the more people will join in – and that means more exposure for your brand. If you want everyone to have a chance of competing, not just existing customers, make a contest where the rules of entry are to repost a photo from you. An example of a brand who launched a successful contest is Picsart. 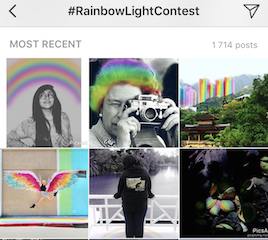 Picsart is a photo editing tool that encouraged their audience to share social media posts, including the hashtag “Rainbowlightcontest” in order to join their competition. 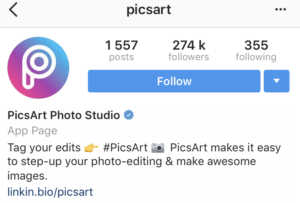 Their campaign generated 1714 posts that their users shared with that particular hashtag – and those 1714 posts means a ton of exposure for Picsart! This is also proof that even though you aren’t selling a physical product, you can still succeed with getting your customers to share their experiences with your brand. 2. Offer coupon codes. Contests aren’t the only way to get your customers to share their experience with your brand on their social media. Another way is to offer coupon codes to everyone who makes a post with your products. This method has two benefits. Firstly, you’re encouraging your existing customers to become returning customers, and secondly, the people who decide to share a piece of content in order to get a discount code are the people who most likely are satisfied customers, because if they would be unsatisfied, they wouldn’t want to get a discount nor shop from your company again. This method has two benefits. Firstly, you’re encouraging your existing customers to become returning customers, and secondly, the people who decide to share a piece of content in order to get a discount code are the people who most likely are satisfied customers, because if they would be unsatisfied, they wouldn’t want to get a discount nor shop from your company again. Even though they aren’t running a competition, they still get a ton of reposts – which is exposure for them. The great thing here is that the content being shared will almost solely be positive reviews and words about your company – which is great peer-to-peer marketing.! 3. Repost your favorite customer photos. This strategy works best if you have a large following. Let your customers know that you feature your favorite customer photos on your own social media page and ask them to share their best photos. As a lot of people want their content to be seen by the eyes of more people, this will motivate a lot of people to share high-quality content of themselves using your products. Another benefit of this method for you is that you get a ton of great content that you can use later on, without creating it yourself. A lot of social media platforms are now offering brands the opportunity to market their brand. Not to mention Instagram and Snapchat that not too long ago introduced ads on their Stories. On Instagram, for example, you can run extremely targeted ads thanks to the fact that Facebook now owns Instagram – and if you weren’t aware of it, Facebook knows a lot about their users, which is a huge benefit for brands because they’re able to run laser targeted ads. The best part is that you as a brand can benefit from this! The age of expensive billboard ads and TV-commercials with a low ROI is slowly fading away. Now, more brands are realizing the true potential of running targeted ads on social media platforms. Depending on your objective, you can set up your campaign differently. With Twitter ads, for example, you have the ability to set up your campaign differently based on the goal you set. When setting up your Twitter ad, you can choose from 4 different goals based on what you want the marketing campaign to do for you. If you, on the other hand, want to run ads on Instagram or Facebook, you can choose from an even greater list of objectives that are much more diverse. All in all, you have to see which social media platform is the best for you to run ads on and take things like user demographics into consideration. And of course, experimenting with different ads and trying out yourself is always best for generating the highest ROI possible. When I run ads on social media, I have a small budget and experiment with different objectives and content before I start spending real money in order to see which campaign generates the best results – and you should too! Social media can do a lot for your brand when it comes to marketing. What was initially something that people thought was going to be a trend has now become one of the world’s most effective marketing tools for brands. By learning how to target and reach your audience, while building a strong social media strategy, social media will help you reach tremendous marketing success. Great artical dude! 10/10 mate. Ps. I’m looking for a job! Extraordinary, well done. This is exactly the kind of article I want to read to become a wealthy, successful businessman. The key to success is definitely to read Mr. J’s articles. Thanks again!